Found throughout England, Wales and Scotland although in the west and far north of Scotland records are more scattered. Generally regarded as a woodland insect and this seems very much the case around Watford where they are found throughout Whippendell wood and along the wooded margins of Cassiobury park. 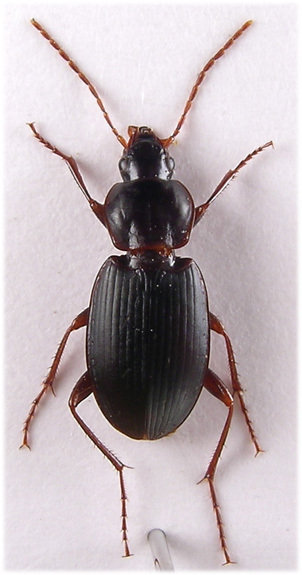 Sometimes active with other carabids e.g. 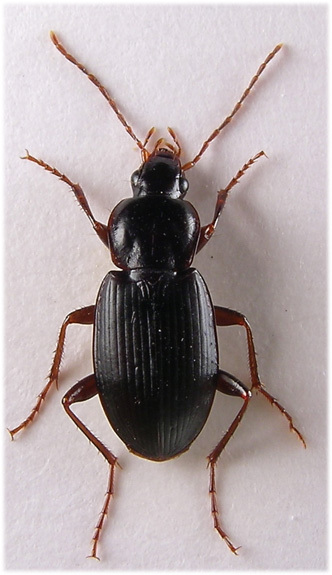 Calathus fuscipes Goeze and Pterostichus madidus Fab. nocturnally on parkland pathways but usually only as single specimens and never in numbers. 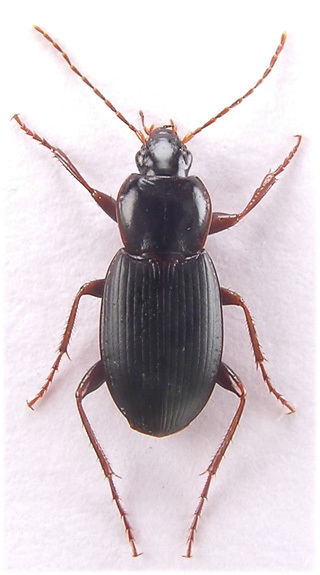 Occasionally found in town centre pitfall traps in late summer or autumn after the larger carabids begin to reappear following the summer diapause. 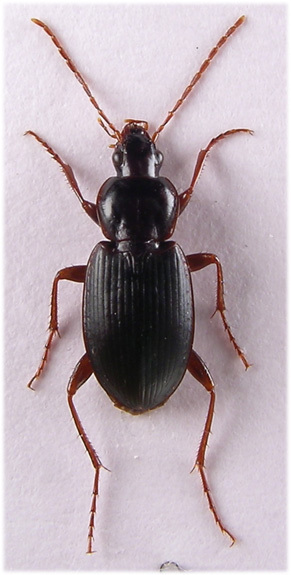 An autumn breeder encountered most frequently under damp logs in woodland during December and January. Large, 8.5-11mm., identified in the field (X10) by the reddish pronotal margin but this must be looked for carefully and experience is needed with this species. Appendages red but legs generally darker than antennae and palpi. Antennae long and filiform. Terminal segment of labial palpi cylindrical and truncate. Two long setae along inner margin of eyes and head with a fine ridge from the top of the eye to the antennal insertions. Pronotal hind angles rounded, hind margin weakly sinuate and front angles gently emarginate. Lateral margin widened to obscurely delineated broad basal fovea, setae at hind angles and before middle laterally. Sides and base narrowly red. Elytra glabrous, characteristically elongate with strongly angled shoulder striae and nine well impressed striae to apex, usually punctate towards base. Third striae with four (usually) or five distinct larger punctures. Margin and sometimes suture narrowly red. Ventral surface strongly convex compared with upper surface. Tarsal segments glabrous above or with a few scattered small hairs. Claws serrate, obvious at X20. Male protarsal segments unmodified, female elytra dull.